Cloud-based computing is reshaping the ways that software, hardware, and networks are acquired and deployed. It has already transformed a variety of enterprise services, but adoption of cloud CAD lags behind. What are the advantages, and the reasons for resistance? And what can CAD users expect from cloud solutions in the near future? The leading professional cloud CAD products that are available on the market today, or will be soon. 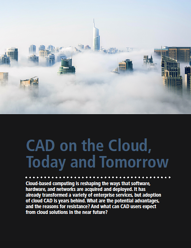 To gain a clearer understanding of what the cloud means for CAD users, download your copy of this free white paper today! Produced by Cadalyst. © Longitude Media.